A friend in Puerto Rico, Jennifer, tells me that her town has been on a boil notice for 5 1/2 MONTHS following Hurricanes Irma and Maria. Yep, you read that right. Five and a half months. That’s almost 170 days without clean running water. She could probably teach a college course on how to survive a boil notice! The water that comes out of your tap, if it does, isn’t drinkable. When someone is thirsty, the only safe water is bottled or has been purified in some way by you. A recipe calls for water and, again, you have to be careful to use only what is safe to drink. The refrigerator ice maker has to be turned off because tainted water results in tainted ice cubes. If you want ice, you either have to buy it or make it in ice cube trays with purified water. Showering and bathing cannot be done in contaminated water, so what do you do, day after day after day? Washing dishes isn’t safe anymore unless you’re certain the water in your dishwasher heats up to at least 170 degrees. Is it safe to even do laundry? With certain contaminants, it is not! What about water for your pets? Is it safe for them to consume? The water filter on your refrigerator or the reverse osmosis system you rely on are not enough to remove most pathogens from water. Can you imagine this nightmare continuing, week after week? Dirty dishes, laundry, smelly kids, the hassle of having to boil every ounce of water consumed — this would get old in a matter of hours. 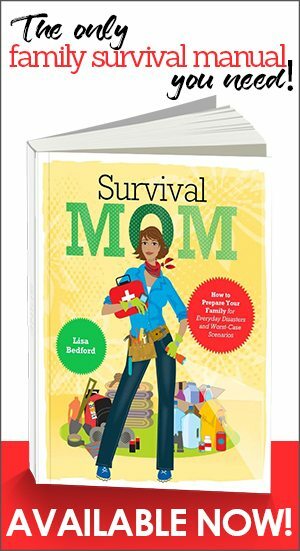 The only way to survive is to be prepared and know exactly what to do. In Jennifer’s case, her town had to share a large generator with another town. This generator was all they had to pump large amounts of water through a filtering system. The water had to be shared with every household and then they had to wait until it was their turn for more clean water! What is a boil notice? When a municipal water provider or a health agency detect pathogens in the water, a boil notice will be issued. Those pathogens might include E. coli, Giardia, and Cryptosporidium. Lead in water is another red flag, and a water main break as well as flooding all necessitate a boil notice. A boil notice can last anywhere from just an hour or two to months, as we’ve seen in Puerto Rico. The best way to find out if a boil notice has been issued for your community is to visit your local municipal water company’s website and find out what their procedure is for issuing and then rescinding the notice. These might be issued via email, text message, the local media and/or the company’s website. The safest and quickest method will be either email or text. Don’t rely on the 6 o’clock news to get this information! How do you survive a boil notice? The best way to survive anything at all is to prepare for it. 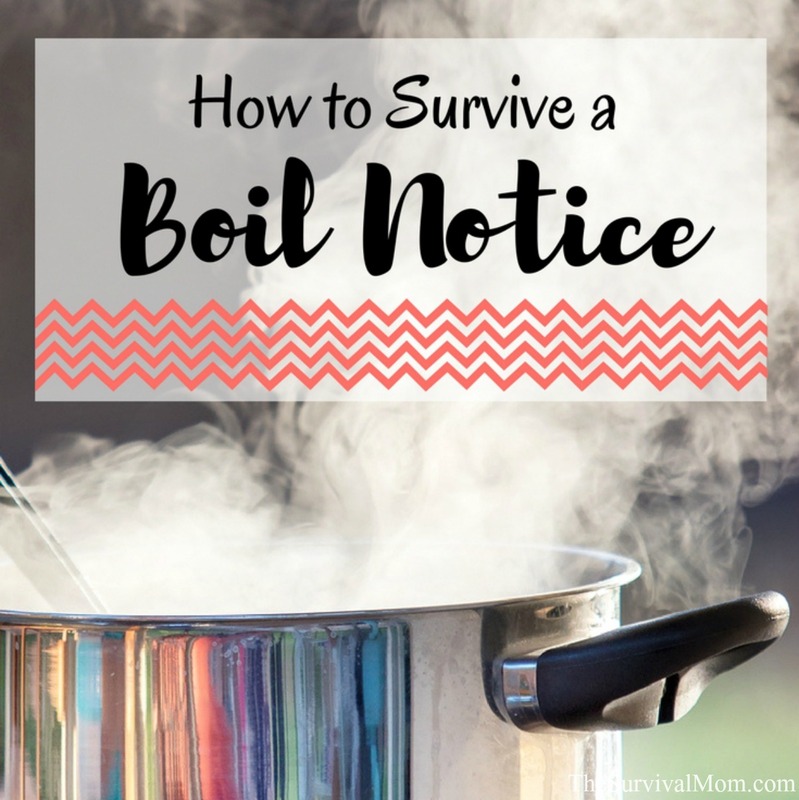 Now that you know a bit about boil notices and why they’re issued, let’s get your own household ready. You will probably not be told exactly what is in the tainted water, so pay careful attention to exactly what you are told to do and not do with tap water. 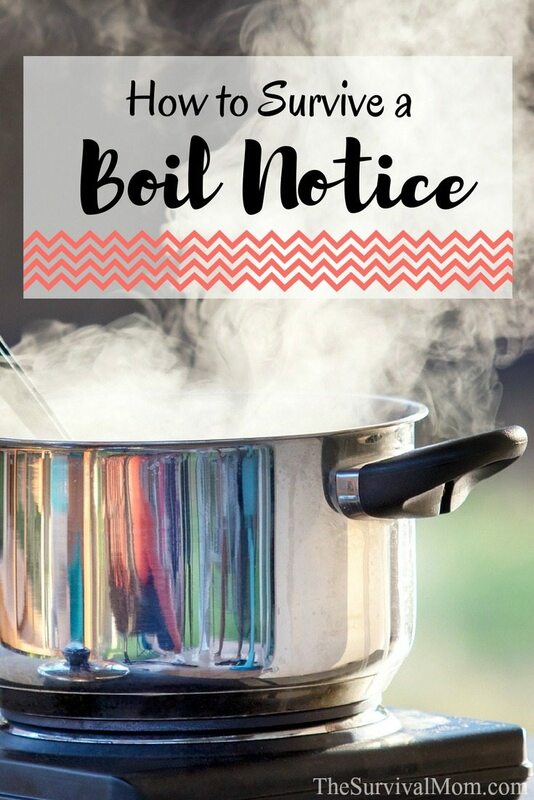 Some boil notices will specify “do not use for drinking, cooking, or ice making.” Okay, the water cannot be ingested but can be used for laundry and bathing. When a boil notice takes this a bit farther and includes laundry and bathing, you can bet the water is not even safe to touch. Over the next week, keep a running list of how your household uses water. Does everyone take a shower or bath daily, or more often? Do you need water for how many pets? 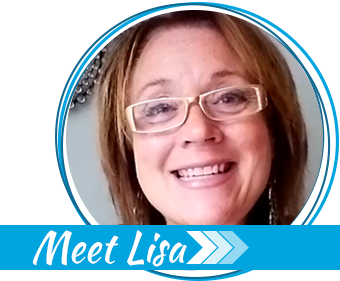 Is your home regularly filled with additional people — family, friends, or anyone else who you might need to include in your water plans? If your water was too contaminated to even touch, you’ll need a backup plan for doing laundry, cooking, staying hydrated, refilling humidifiers, and providing water for animals. After 7 days of tracking your water usage, you may be shocked by how much water you use, but at least now you’ll have a starting point for your plan to survive a boil notice. Your next step is to go through the list and see where you might cut corners and use less water. If everyone bathes daily, that’s a quick way to use hundreds of gallons less each week. Sponge baths, especially when a no-rinse soap is used, is the obvious substitute. No-rinse bathing wipes are a godsend during a time of water scarcity (handy to keep in the car, too). Since the most important use of water, by far, is to remain hydrated, try to find ways to either eliminate completely or greatly reduce the water needed for all other uses. Stock up on bottled water with the intention of using that water for drinking, brushing teeth, and cooking. Bottled water has an indefinite shelf life if the water comes from a pure source (city water, water that has been boiled then cooled, and/or water treated with bleach) and is stored in a cool and dark location. My personal recommendation for bottled water is Dasani. If you compare the plastic used for Dasani bottles with the bottles of most other brands, you’ll notice a huge difference in quality. If you have kids or grandkids in the house, your life under a boil notice is going to become far more complicated. Kids are used to water being available anywhere, at any time, for drinking, recreation, water balloons, you name it! Now, in a moment, that water isn’t safe for them to ingest or, possibly, to even touch. Only drink water from a bottle. Do not use water from any faucet. Brush your teeth and wash your face using only bottled water. Use hand sanitizer in place of soap and water. Use masking or packing tape to wrap around faucets and handles, disabling them. 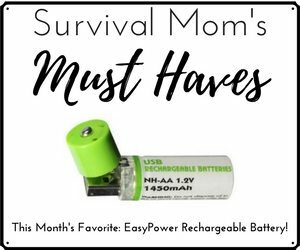 Make sure these are kid-proof! Pour bottled water into familiar containers, like pitchers or a countertop water dispenser. If you have kids, this will be an easy way for them to drink safe water from sources they are already familiar with. Stock up on those no-rinse bathing wipes. Store one case of water bottles per day for each day of a possible boil notice. A case of 40 half-liter bottles will provide a little over 5 gallons of water. This is barely enough to provide 1 gallon per person per day, but if you store 7 cases of these, you’ll have the minimum amount of water for 4 people for 7 days. When a bottle of bleach is empty, refill it with water for an emergency water source. Be sure to label the bottle as “Drinking Water”. Fill an empty container of laundry soap (the large containers with a spigot) with water and use that as a source of water for hand-washing. Learn how to use water from your water heater in a dire emergency. If necessary, turn off the water coming into your house. Have a plan to stay with friends or family outside the boil notice area. Most people have absolutely no idea what to do in case of a water emergency or how to survive a boil notice. You don’t have to be that person! 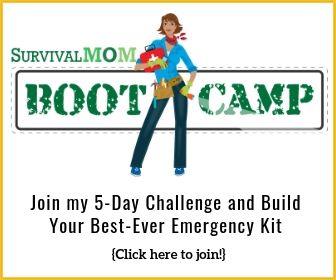 Check out this class from Preppers University for a complete education in creating your own water survival kit, know exactly how much water to store, watch my 54-minute video lesson, get printables and downloads and be ready for any type of water emergency. If you do not have or want to use baby wipes or shower towelettes, a tablespoon of apple cider vinegar in a 16 oz. bottle can be put on a washcloth or even a paper towel, and used to wipe yourself clean. We do this when camping. Start with the least dirty places, like your face and work toward dirtier places. If using a cloth, you can use a quarter of it and have four sections to wash with. This is surprisingly refreshing and while not a hot shower, really helps me feel better when out in the wild!!! Very good suggestion! That’s one more use for vinegar, one of my favorite products! Here in Sweden were I live there are towns that had those situations for a month. And I am pretty sure that a while ago there were a town were they had it for a few months. Couldn’t find it now though. What’s the most efficient way to measure used water? I’m not sure how to even begin..
That’s a very good question. The simplest way is to check your water bill for usage. However, that doesn’t give you a detailed picture of where and how you can conserve. In that case, keep a tally of the loads of laundry you do, the number of times you run the dishwasher, the number of toilet flushes, and how many showers/baths take place. The water you use for drinking and cooking will be much smaller amounts than these and almost negligible in the big scheme of things. Once you have numbers for laundry/dishwasher/bathing, you can estimate 45 gallons of water for each laundry load (if you have a high-efficiency washer, it could be anywhere from 15-30 gallons, so check the manufacturer’s website), 6 gallons per dishwasher load, and 5 gallons (approximately) per flush. As far as showers and baths are concerned, you’ll have to do a little research about what type of shower head you have and how long the average shower is in your household. Shower heads can use anywhere from 2-10 gallons of water per minute depending on whether or not they are water-conserving or not. That’s a big difference, so get that figured out for each shower head in your home. The average shower is about 12-15 minutes long, so once you have an idea of how much water the shower head puts out per minute, you can do some calculating for a rough guess. Love the link to the no-rinse body wipes, and especially the bottles of no-rinse body wash. I’ve had bad luck with pre-moistened towelettes drying out when I buy them in quantity, and will be getting the bottles to use in an emergency. This comes as an addition to a recent report where Coca Cola admitted that the water they’ve been selling – Dasani is in fact only a “purified tap water that is ”. Not commenting on the water itself but the quality of plastic used. I wonder if they’ve tried using solar UV to purify water in Puerto Rico. It seems like long term, that would be a good option. In Africa, they use the clear water bottles (like the ones we buy in 24 bottle cases) to purify water. It only takes 6 hours in direct sunlight or a couple of days if cloudy to treat the water. The sun’s UV rays kill the organisms. I like to drink non-carbonated flavored water in 1 liter bottles. since these have no return deposit on them I was them out and refill them with tap water and store them in my deep freeze and fridge freezer. I also store them in closets and under the cabinets. I have over of 100 of these bottle’s stored around the house. When I move the clocks in the spring and fall I use the water to wash clothing and refill the bottle’s. I am always adding to my store of bottles. The frozen bottles do not get cycled and will help keep the freezer’s cold in a power outage. It also help make the freezer’s run more efficiently. And I will have a supply of “ice” for the coolers if needed. you can do this with any type of “pop bottle” and juice jugs. The current water bottles are so thin and seem to break down quickly too. This will not work with milk jugs for 2 reasons. 1st you can never truly clean them out well enough and 2nd the type of plastic they are made of breaks done quickly. Good tip on using bleach jugs. WATER: Though our Australian Water is completely clean for all purposes, we still filter it for drinking. But in case of water pollution, we collect rain water in a few 1000 gallons tank, via a special device that rejects the first hour of a rain storm water into a dirty water tank so that both the air & roof will be thoroughly cleaned. Our use of water is micro-conservative like fine sprinkle showers with us both in same shower, used water on new food plants, no toilet flush because toilet = deep hole in the ground with a nice seat on top. Only a cup of water for teeth cleaning. Urine goes around fruit trees. Laundry we gently stamp on whilst showering; or put the laundry in an esky of water & drive or cycle for a few minutes, as one girl does here. To dish-wash, simply use glass bowl to cut food in, cook in same dish & wash it + other items & dishes in same bowl; better alternative is turn preferably hot tap on to light sprinkle dish being scrubbed with a hard brush – water goes straight to garden or for cooking water. Do Laundry, rinse & wash car in rain! We sometimes bathe in our dam, in a creek or in the ocean with several layers of our CLOTHES ON to launder them & our bodies. We never water grass.